In a series of interviews published today, UK scientists and experts have warned of the “barrier to innovation” facing British farming following the European Court of Justice’s ruling affecting gene editing, but also highlighted the opportunity Brexit represents for the UK to spur innovation. The four in-depth interviews with those on the country’s agricultural frontline, cover subjects as wide-ranging as the impact of rising temperatures and the challenge of engaging an increasingly urban population in where their food comes from. The site also discusses ideas for meeting current challenges. 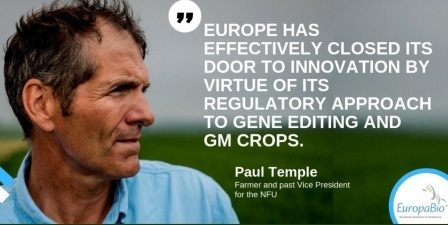 Their comments echo the findings of a report authored by independent expert Graham Brookes last year, which found that the EU crop biotechnology regulatory system has already contributed to a significant loss of high value-added research scientist jobs and has left the UK subject to a crop trait research and development ‘gap’. The paper concluded that the potential long-term benefits to the UK economy are likely to be highest if the UK sets its own path on EU crop biotechnology based on sound science, consistent with the regulatory systems operating in most other countries of the world. Click here to see the full press release. You can read the complete interviews here.